Grew Up… independently. Ruby's father, Stobrod, was an alcoholic whom she left as quickly as she could. He was never a dependable father, spending more time with his fiddle than raising Ruby. 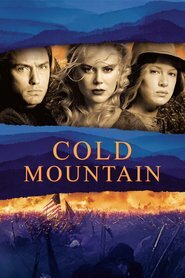 But still, something of his gruffness must’ve rubbed off on her, because she grew into the toughest woman Cold Mountain has ever seen. Living… on the Black Cove Farm, in Cold Mountain. She came to the farm to help Ada, a city girl raised to be a good Southern lady. Ada, however, has no idea how to keep up a farm, and with all the men are fighting in the Civil War, Ruby is the only help Ada has. As Ruby puts it, “Ain't no man better than me. On account of there's no man around here that ain't old, or full o' mischief.” Luckily, Ruby is about the best help Ada could ask for, and not only do the two efficiently turn the decrepit farm around, they also bond as women. Profession… farm worker, for now. After a life of doing odd jobs, Ruby's the kind of woman who can do just about anything. She's used to getting her hands dirty, calmly picking up a rooster and tearing off its head for supper. Interests… eating well, surviving the winter, and keeping her shotgun close. Ruby clings to her tools for survival. She’s interested in utility, in things she really needs. Relationship Status… single. She doesn’t want to become an old maid, but for now, her only companion is Ada. Challenge… turning around the worst-looking farm in Cold Mountain. When she arrives, she asks Ada what she’s holding a rake for, because it “Ain’t for gardening, that’s for sure”— not when there's barely anything to garden. Personality… spry, curt, and tough. Ruby speaks her mind, and isn’t prone to softening her words for the faint of heart. From the beginning, she’s upfront about the deal between herself and Ada, telling her new companion, “I’m not a servant.” Ruby has a great pride in herself and her capabilities, and she won’t be treated like an expendable worker. Ruby Thewes's popularity ranking on CharacTour is #3618 out of 5,000+ characters. See our top-ranked characters and read their profiles.